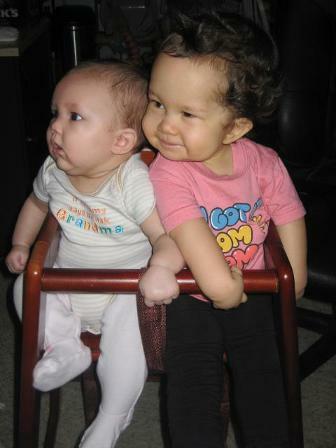 Mikaela and her new little sister, Naomi. 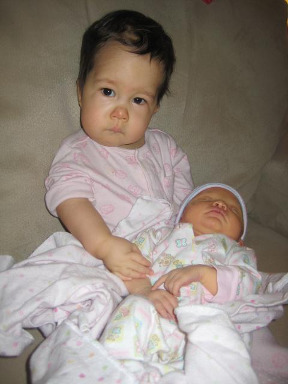 December 9, 2009 Mikaela became a big sister! 6 lbs 3 ozs, 19.5 inches long. Naomi's pregnancy and delivery was a complete breeze compared to Mikaela's. I knew I was pregnant with Naomi around 4 weeks, but I didn't go to a OBGYN until 5 months. I did go to my Hematologist right away to make sure my blood was fine, and I did have to take shots through out my pregnancy. They were blood thinners called Fragmin. Every morning I gave myself a shot in the stomach, which was probably the hardest part of it all. I found a Great OBGYN, and I did have to go to a few specialist since I was "labeled". They say anyone who had a baby with an anomaly goes through the same procedures. There was a lot of doctor appointments but it was nice seeing Naomi hanging out in Mommy's belly, more than you normally would with a pregnancy. 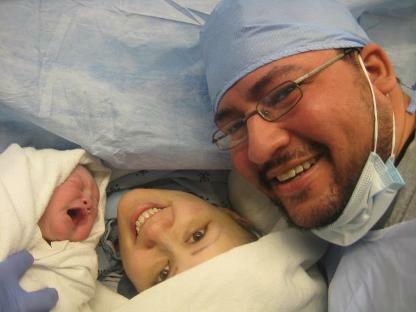 When it came to my due date, which was December 16th, the doctor wanted to do the c-section a week prior. I chose December 9th since Murad's birthday is also on the 9th. I was told I'll probably have to be put to sleep because of my blood condition and throughout the whole pregnancy I was preparing myself for that. But a week before, my doctor told me that he's pretty sure I'll be awake for it and Murad would be in the room with me. I was so excited I rushed home to tell Murad the good news! December 9th came and it was one of the most amazing experiences I've ever had. We got to the hospital in the morning around 7:30 and by 9:30 they told me all is well with my blood and I'll have a spinal. The reason you would be put to sleep is because being on blood thinners, having a spinal could paralyze you. But I stopped the blood thinners 3 days before and we were good to go! They brought me into the the delivery room, told me to lean forward on the table, gave me my spinal (which I only felt a little burn) I lied down and Murad was brought in. There we were! In the same room, holding hands waiting to hear the cry of our next baby girl! Within a few moments they let me know I was going to feel a lot of pressure and before you knew it, a loud cry belted out! Naomi has arrived! And she was so beautiful. Tears filled my eyes because my prayers were answered. 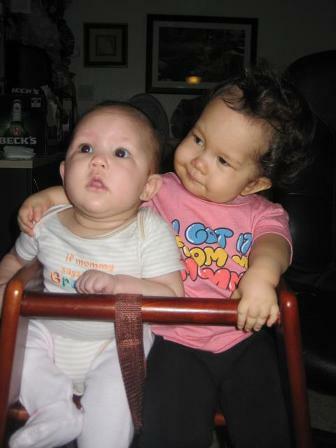 I wasn't able to hear Mikaela's first cry, or experience that moment with Murad, or even see her for a day and a half. And there was Naomi, all bundled up. They brought her over to me and as soon as I said, "It's ok, Mommy's here." She stopped crying and life was just beautiful. I couldn't be more thankful for the whole experience. but over time, they have learned to love one another. Or just realized that they don't have a choice.